The weather on the morning of 31 December, 1944 was already unpleasant. In the Ardennes, hard-pressed German troops were battling Allied ground forces advancing through several inches of snow. Above, darkening skies heralded the arrival of more snow. At 10.45am, in deteriorating weather, a battle formation of 30 Fw190D fighters climbed out of Varrelbusch and headed south over the snowcovered landscape. Under the command of 12./JG54 Staffelkapitan, Oblt. Hans Dortenmann, and initially tasked to provide air cover to their beleaguered comrades below, the group was re-assigned to intercept enemy aircraft in the region of Limburg almost immediately the pilots were airborne. Flying south they ran directly into the oncoming weather, and with visibility dangerously reduced, Dortenmann elected to climb through the solid cloud into clear air. 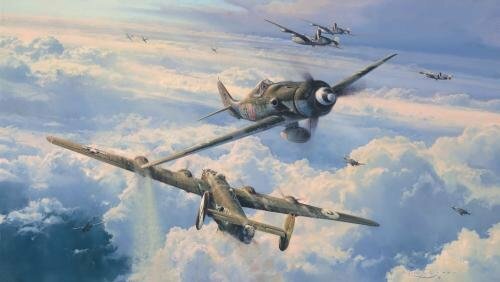 As the Fw190s broke cloud above the area of Koblenz they sighted a formation of nine 2nd Air Division B-24 Liberators and formed up for an attack. Some 6000 feet above, top-cover P-51 Mustangs had watched the Fw190s climbing through the banks of clouds, and turned 180 degrees to position behind the Luftwaffe fighters. Diving in from their height advantage, the Mustang pilots entered the fray and within seconds the sky was filled with swirling dogfights. Every print in this edition has been signed in pencil by THREE top pilots who flew with JG54 - The Green Hearts. Each print is also signed by artist Robert Taylor, and individually hand-numbered.